The Internet is the new medium for promoting and selling your products and services to customers across the globe. 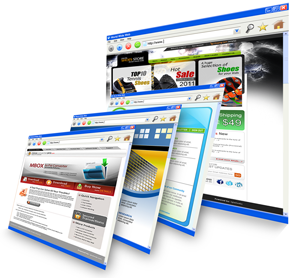 A Good designed website is there-fore the most important tool to attract customers. A Good website design must have visual appeal, user friendliness, rich content and above all, be search engine optimized in order to attract & retain visitors. We at igladweb ensure your website works for your business. Mere presence is no presence on the web; users should actually know your existence, visit your website, appreciate you and translate to leads or sales. With 4 years of experience and having created thousands of web sites we know what it takes to create websites that meet client requirements and website objectives. From static HTML based websites to DB (database) driven e-Commerce or Portal website development to Classy Flash sites, trust us to give you a website that meets your business needs. friendly and result-oriented get in touch with our team. Our specialized services and unique blend of strategy, technology, design capability and quality implementation has helped us gain our clients’ confidence and excel in this domain of portal development. Discovery –Understanding your web site goals and audience. Planning –Establishing timelines, deliverables, and development solutions. Content Architecture –Planning your website content and structure. Design –Creating and refining interface and graphic design elements. XHTML Conversion –Understanding your web site goals and audience. Development –After design approval, actual development of website begins. Testing –Bringing it all together. Discovery –Testing your web site in multiple browser environments. Launch –Launching the website on live servers for everyone to see.